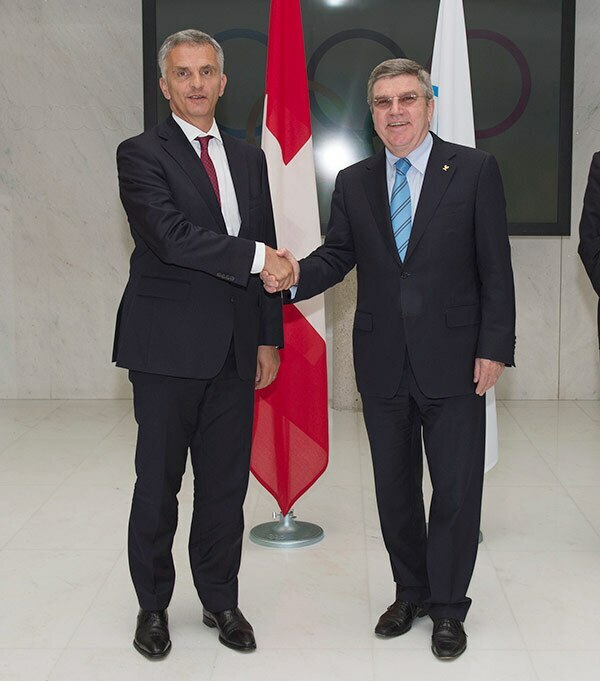 On 9 May, IOC President Thomas Bach welcomed the President of the Swiss Confederation, Didier Burkhalter, to the IOC headquarters before a visit to The Olympic Museum. The two leaders discussed a number of items of common interest, including the long ties between the Olympic Movement and Switzerland. They also assessed the highly successful Olympic Winter Games in Sochi, with the Swiss President having just returned from meeting President Putin in Moscow, where he led the OSCE (Organization for Security and Co-operation in Europe) delegation. 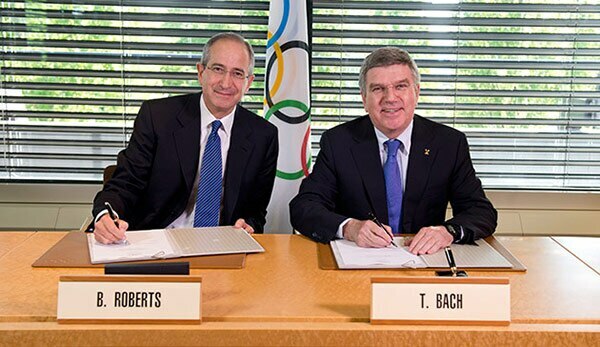 President Bach observed that “the ties between Switzerland and the IOC are based on great cooperation in the past. We feel at home here in Switzerland, and we certainly hope that it will be possible for this to continue, and this is a sentiment echoed by many of our partners from International Federations and other sports organisations who followed the IOC’s lead and set up their headquarters in Switzerland.” Discussions also touched upon the celebrations surrounding the 100th anniversary of the IOC being headquartered in Lausanne which will be marked next year. Also on 9 May, President Bach received the President of the Republic of Singapore, Tony Tan Keng Yam. The two leaders also toured The Olympic Museum. During the meeting, the IOC President, who was accompanied by IOC member in Singapore Ser Miang Ng, thanked Singapore for all it had done for the Olympic Movement, particularly in staging the first edition of the Youth Olympic Games. 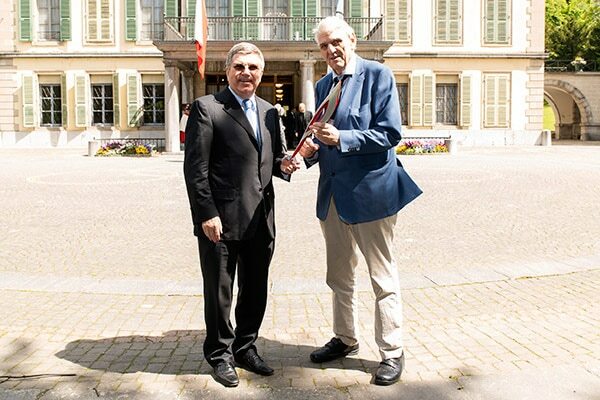 At the start of the week at the Villa Mon-Repos, President Bach met a Lausanne City Council delegation led by Mayor Daniel Brelaz, whom he presented with an Olympic torch from the Games in Sochi. 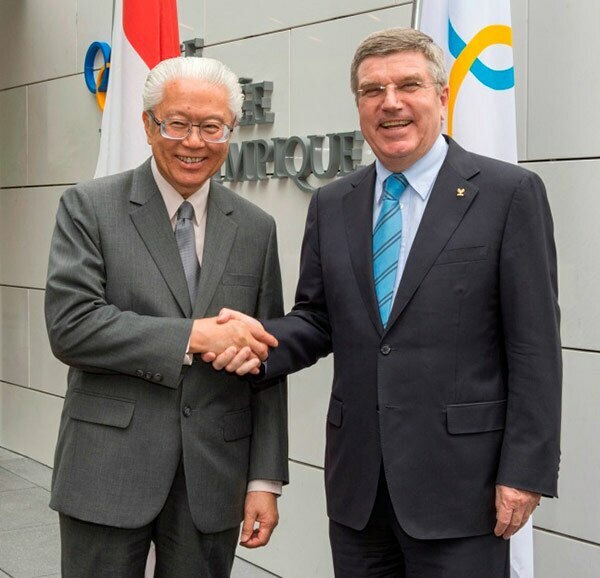 Their discussions centred on relations between the IOC and the city of Lausanne. On the same day, the President welcomed the members of the 2022 Winter Games Applicant Cities Working Group, which was meeting in Lausanne from 5 to 9 May. On 5 May afternoon, President Bach attended a thank-you drinks reception with the whole IOC administration in order to celebrate the success of the XXII Olympic Winter Games in Sochi. The Chairman of the IOC Coordination Commission for these Games, Jean-Claude Killy was present. Jacques de Navacelle, Pierre de Coubertin’s great-nephew. 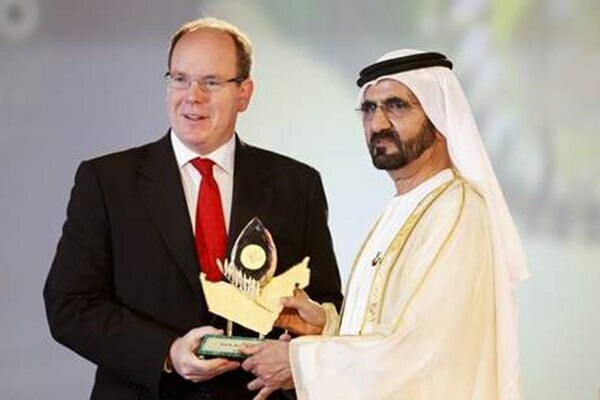 Prince Albert II was presented with the Zayed International Prize for the Environment by the Vice-President of the United Arab Emirates and Ruler of Dubai, Sheikh Mohammed bin Rashid Al Maktoum (right of photo), at a ceremony held in Dubai (United Arab Emirates) on 7 May. He was honoured for the prolific environmental work carried out by the Prince Albert II Foundation, created in 2006. 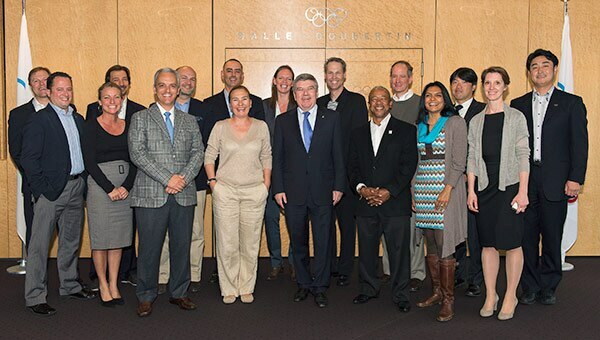 This week, representatives from the Worldwide TOP Partners gathered at the IOC headquarters in Lausanne for a two-day “TOP Leadership Group” meeting. On the morning of the first day, Partners had the chance to meet President Bach, who hosted an interactive session with the attendees regarding the Olympic Agenda 2020. In the afternoon, there were discussions on key topics for the TOP Partners and the IOC, including digital technology, legacy and sustainability. On day two, Rio 2016 Organising Committee President Carlos Nuzman and members of his team gave an update on preparations for the Games in 2016, underlining the importance of the Partners for the success of the Games. Presentations were also made regarding the Sochi 2014 Winter Games and Nanjing 2014 Youth Olympic Games, and an update was given by the PyeongChang 2018 Organising Committee’s commercial team. The International Canoe Federation (ICF)’s first Canoe Sprint World Cup of the 2014 season was held in Milan (Italy) from 2 to 5 May, with several Olympic and world champions taking part. Paracanoe events were also held, ahead of the debut of these events at the 2016 Paralympic Games in Rio. The Milan course is also the location for the 2015 ICF Canoe Sprint World Championships, which will act as the 2016 Rio Olympic Games qualification event. Details on www.canoeicf.com. The International Swimming Federation (FINA) informs us that the potential host cities and countries for the FINA World Swimming Championships (25m) and FINA World Aquatics Convention in 2018 and 2020 will gather in Lausanne on 13 May. Attending will be representatives from the following cities and countries: Astana (Kazakhstan), Copenhagen (Denmark), Hangzhou (People’s Republic of China), Tokyo (Japan), Russia and the United Arab Emirates. Doha (Qatar) will stage the Championships and Convention in December this year, while Windsor (Canada) will host these events in 2016. Details on www.fina.org. Meeting in Tokyo (Japan) alongside the 2014 World Team Table Tennis Championships, the International Table Tennis Federation (ITTF) Board of Directors took some important decisions for the future of these World Championships. One such decision was that, in future, doubles pairs can be formed by players from different associations. The Board also decided to reduce the numbers of players per association for the individual Championships in 2015 and 2017, and to fix the number of teams at the 2016 World Team Championships to make the event more manageable for the host nation. Details on www.ittf.com. From 6 to 9 May, the NOC of Bahrain hosted the Olympic Solidarity and Olympic Council of Asia Regional Forum for West, Central and South Asian National Olympic Committees. Bringing together around 90 representatives of 26 NOCs, the Forum addressed the main sports events in 2014, including the Youth Olympic Games (YOG) in Nanjing (People’s Republic of China), the Asian Games in Incheon (Republic of Korea) and the Asian Beach Games in Phuket (Thailand), and the theme of good governance for NOCs. Details on www.boc.bh. The Belgian NOC (COIB) has launched its “Road to Rio” programme. In collaboration with the Belgian Companies Federation (FEB), COIB Director General Philippe Vander Putten, officially launched the programme by highlighting the different ways in which the new “Team Belgium” concept could add value for companies. Like the athletes now preparing for the Games in Rio, by taking part in this programme, commercial firms can share the same ideals and values. The new COIB logo was also unveiled. It represents an athlete carrying the Belgian flag as a sign of victory. Details on www.olympic.be. At the end of April, the High Level Centre in Bogotá hosted meetings on revising the 1995 law on sport, recreation and physical activity. More than 120 representatives from national sports federations, the Colombian NOC and the Colombian Paralympic Committee (CPC) took part. Also attending were NOC President Baltazar Medina; the Director of Coldeportes and IOC member Andrés Botero Phillipsbourne; and the CPC President, Juan Pablo Salazar. During the past two months, meetings have also been held in the cities of Cúcuta, Cartagena, Ibague, Cali, Medellín and Villavicencio to present the planned changes aimed at modernising this law. Details on www.coc.org.co. The sixth edition of the International Coaching Enrichment Certification Programme (ICECP) recently brought together 24 coaches from five continents and 12 sports. This education programme for coaches has been developed by the United States Olympic Committee, the University of Delaware and the IOC. Conducted in partnership with Olympic Solidarity, the ICECP has so far reached 161 participants from 23 sports and 84 countries over the six-year history of the programme. Begun at the end of last September at the University of Delaware, this sixth edition ended at the IOC headquarters with a presentation of the participants’ projects and formal graduation ceremony. Details on www.udel.edu/icecp. The young Peruvian athletes who will be taking part in the 2nd Summer YOG this summer in Nanjing have attended training sessions led by Alejandro Quiñones, the YOG Ambassador for Peru. The athletes gathered at the Albergue Olímpico, the Peruvian NOC headquarters, in the presence among others of NOC President Jose Quiñones González. In addition, an agreement to help athletes and national sports-related bodies has been signed by the NOC and ADEPOR, a company offering sports-related legal services, headed by Jorge Canales. Details on www.coperu.org.